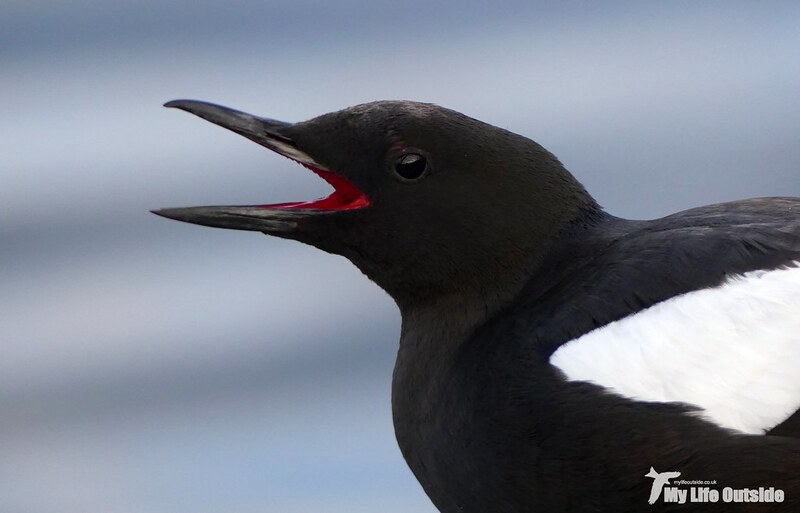 I’ll admit that lying on the pavement at five in the morning trying to explain to a trio of last night’s revellers that the black and white birds I was desperately trying to photograph were in fact Black Guillemots may, to some at least, appear a little odd. On any normal morning hell, I’d have probably agreed with them, but this was by no means a normal morning. Instead of the sound of slamming car doors and fretful children the first rays of light seeping across the sky were met with a deep grumble as giant slumbering diesel engines were slowly coaxed into life. Their acrid fumes seemed in sharp contrast to the fine rigging of a schooner at berth nearby, the high tide lapping gently at her sides as along the shoreline just beneath where I lay. It all seemed a million miles away from our everyday lives and yet at the same time familiar, like an old friend whose re-acquaintance we were just beginning to make. And in many ways that was true for the town of Oban is one which I have visited numerous times over the years, our arrival here the final hop on a long journey taking us away from the stresses and worries of our lives back home and on to a place where time loses almost all meaning save for the rise and set of the sun each day. The hours between are ours to do with as we please. No one judging, no one demanding. A true sense of freedom let loose on the Hebridean wilderness where Golden Eagles display over breakfast and the views appear almost endless. And of the magical vessel which was to take us to this special place? 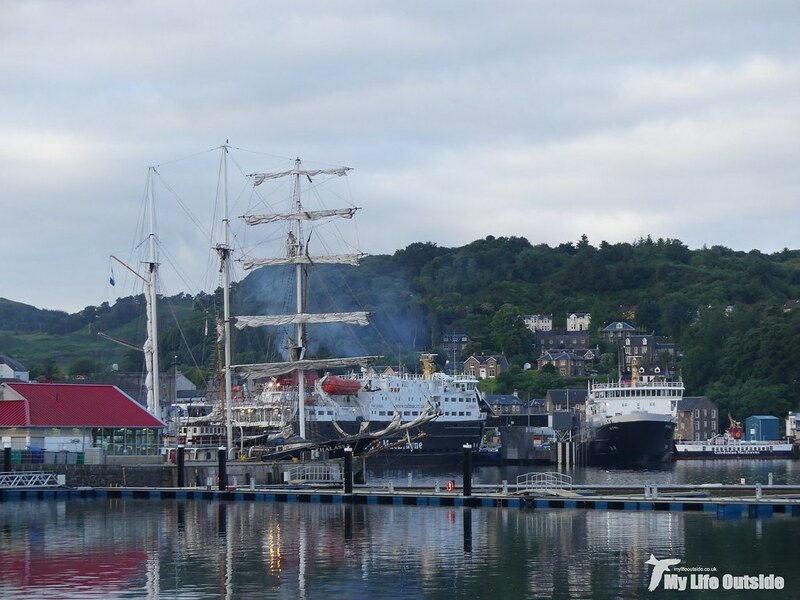 Well she, the MV Isle of Mull, was beginning to stir. 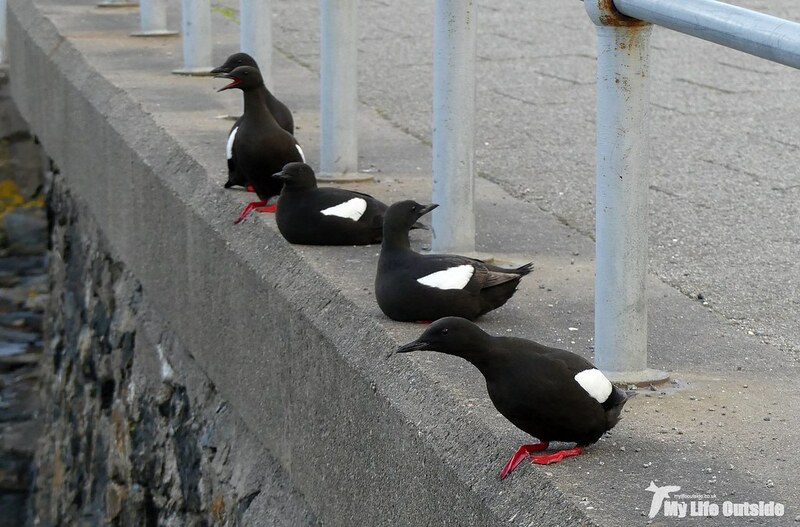 Which brings us back to the pavement, my new drunken acquaintances and those Black Guillemots. 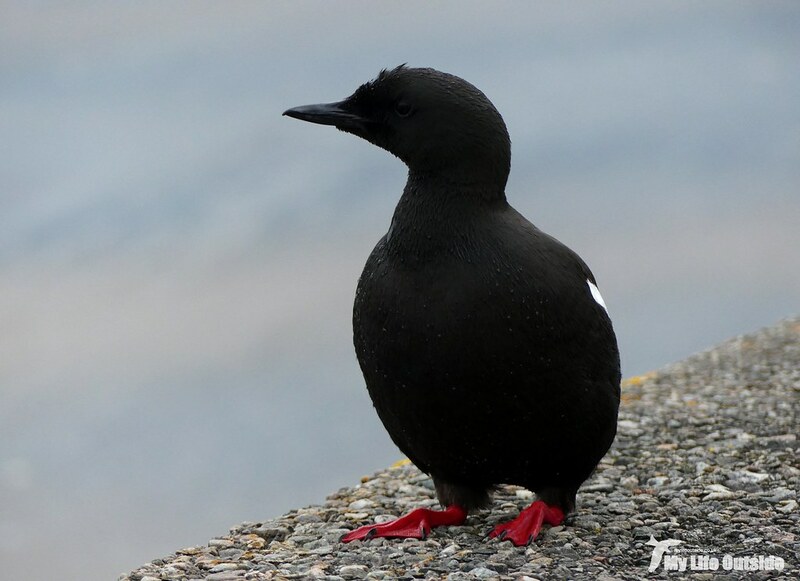 Despite my emphasis I’m still not entirely sure that I got the message across that these weren’t to be confused with your standard run of the mill Guillemots but they at least left happy. To be honest that could have had more to do with the booze and less to do with my imparted ornithological wisdom. Either way I was once more left in peace and could continue the battle which had been raging for the last half hour between said birds, a distinct lack of light and my desire to get these fabulous creatures on film. And trust me they are delightful company to keep. Tame beyond belief thanks to the constant passing of human traffic they are perfectly content to go about their business with barely a seconds thought to this odd mammal and his curious antics. 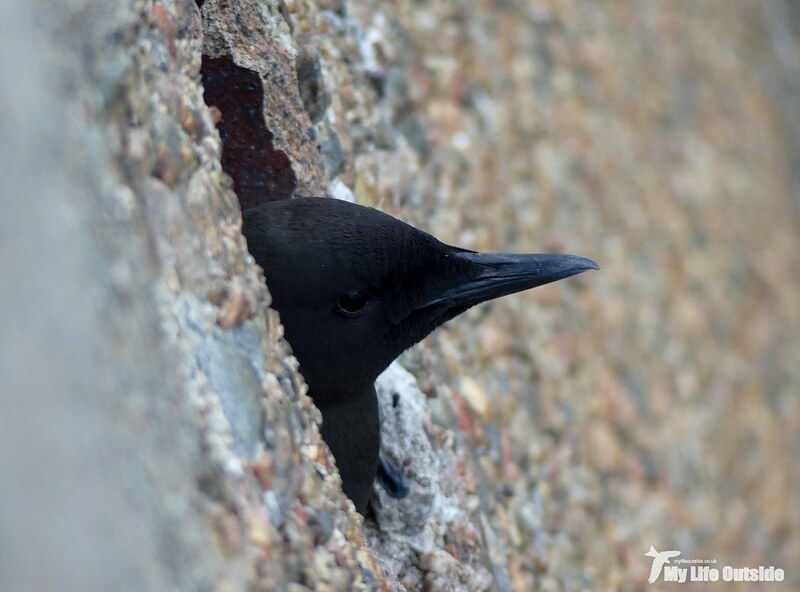 Given the early hour they still seemed to be in wake up mode, up to ten individuals lined up along the sea wall calling in a high pitched voice to their comrades out on the water or those peeking out of nest holes in the wall below. On any other day this kind of spectacle would have been draw dropping but up here it’s almost normal, still completely mind boggling but an accepted every day occurrence in what is still the most wildlife rich environment I’ve ever visited. Our journey here had begun late afternoon the previous day followed by ten hours of driving across five motorways until we rolled into Oban a little after one the following morning. With the town asleep we’d managed to find a spare parking space at the end of the promenade and there had enjoyed a couple of hours fitful sleep, most of which was spent trying to find a comfortable place to rest my head. Dawn breaking was almost welcome relief. Our last minute run for supplies was scuppered by a certain well known supermarket changing its opening hours (Tesco) but we could at least fuel up before boarding and waiting for the off. A Grey Seal searching for an opportunistic meal looked as hungry as we felt though I’d have taken our bacon and sausage rolls over whatever it was having any day. They were delicious. Stomach lined it was up on deck just in time for us to cast off and wave a fond farewell to the mainland. Up ahead the Isle of Mull was already beckoning and I willed us on with greater pace, partly because I was eager to explore its treasures and partly because it was absolutely freezing up on deck. Lack of sleep and a stiff breeze combined to remind us that although this was summer we were still in Scotland after all. Not to worry as I kept myself distracted by watching the Gannets and Guillemots on our way out to Lismore along with the occasional passing Kittiwake. Before we knew it Duart Castle was sweeping by on our starboard side followed by the campsite at Craignure and the message to return to our vehicles. This was it. I still get the same sense of anticipation sitting behind those closed doors as I did on my first trip up here over a decade ago along with the well of excitement as they slowly open and we are finally released onto the island. Everything from here on is familiar. 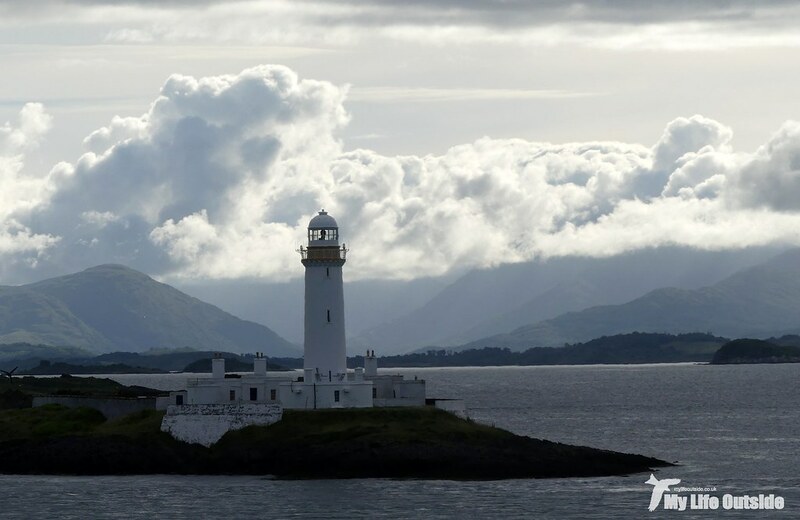 The right turn, sweeping views over the Sound of Mull and the inevitable tourist who isn’t the least bit prepared for the roads which now face them. Single tracked and bumpy they are to be taken with care and it takes a concious effort to focus on them and our destination alone and not the vast array of bird species which are already vying for attention. But it’s so difficult to resist when one moment you’re being confronted by a raft of Red-breasted Mergansers and the next a White-tailed Sea Eagle gliding right above the car. 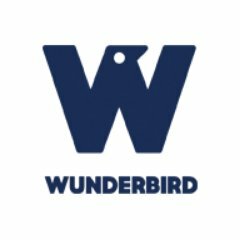 Even after so many years of visiting these flying barn doors are simply spectacular, wings spanning up to two and a half meters and a silhouette that is all but unmistakeable. Having watched it disappear over the brow of a hill we were once more on the move, the last few miles to our base for the next fortnight. Now our exact location will remain undisclosed for hopefully obvious reasons except to say that it’s basic yet everything we could ever wish for. Miles from the nearest neighbour, no TV, internet or mobile signal yet with views to die for and a plethora of wildlife which we aimed to get reacquainted with as soon as possible. Before that though we desperately needed some kip so having unpacked settled down for a nap. Warmed by the sun I could have stayed their for hours, and probably would have too had a knock at the door not startled me awake. And who should we find there? None other than pro wildlife photographers Andy Howard and Pete Walkden. It’s a small world you know. I think I just about carried off my barely awake greeting before we settled down for a good catch-up. Talk inevitably turned to wildlife and we were soon out hunting for Adders. We were under good authority from previous guests that at least one individual was almost guaranteed but we couldn’t find it having to make do with our first sighting of one of the resident Golden Eagles instead. Oh the hardship! Well if the Adders weren’t going to play ball we may as well try for Eagles instead but we’d barely set off in its rough general direction before we were distracted once again in a way that only Mull can conjure up. 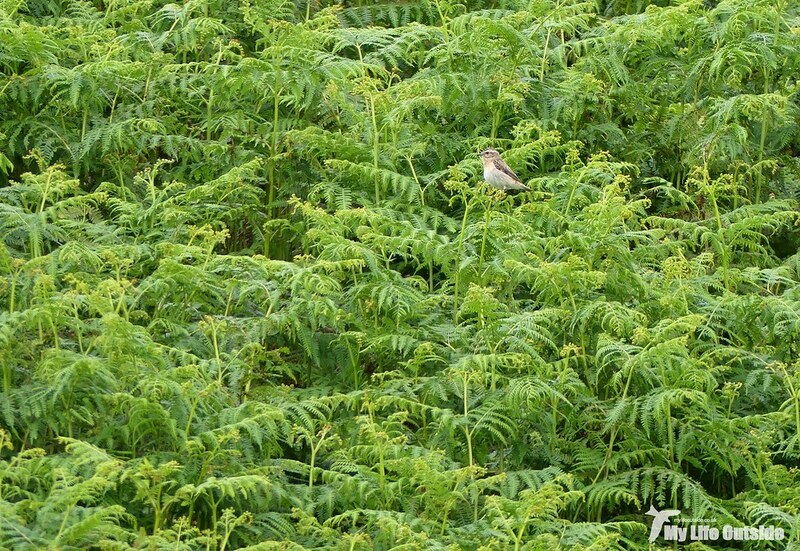 Sitting atop the Bracken were four Whinchat, two adults and two juveniles and all in fine voice. Not wanting to disturb them we kept our distance so a record shot only for now, but what cracking birds for our first few hours here. 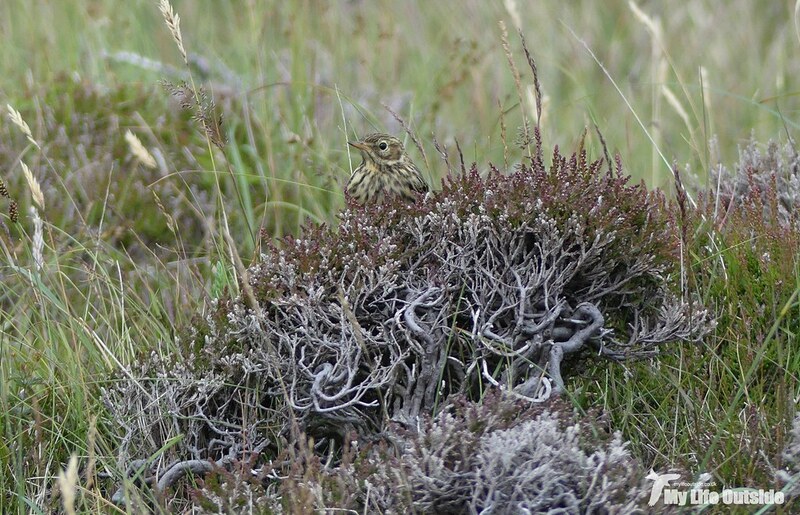 In the same area we also turned up families of Whitethroat, Stonechat and Meadow Pipit before what at first appeared to be a bird of prey popped into view. Landing briefly it was soon mobbed by smaller birds and we quickly realised that it was in fact a Cuckoo. Not top of anyone's guest list around here it was quickly chased out of sight. This was shaping up to be an excellent outing and was about to get even better. 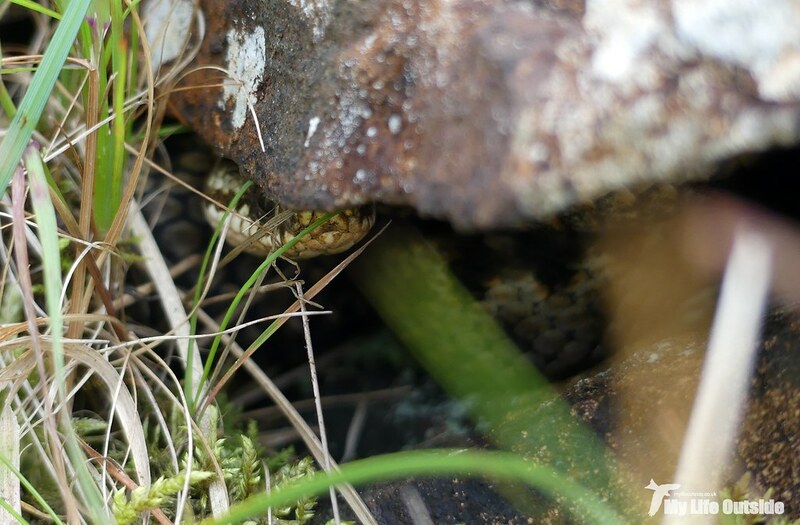 Emma was first to spot the Adder basking in full view, a large female we think and the largest individual I’d yet come across. Creeping in we all managed to get some photos, I with considerable lens envy it has to be said, before we realised that there was a second Adder less than a meter away. Intricately beautiful up close they are remarkably good at blending in as we enjoyed spending the next hour or so with these fabulous creatures. 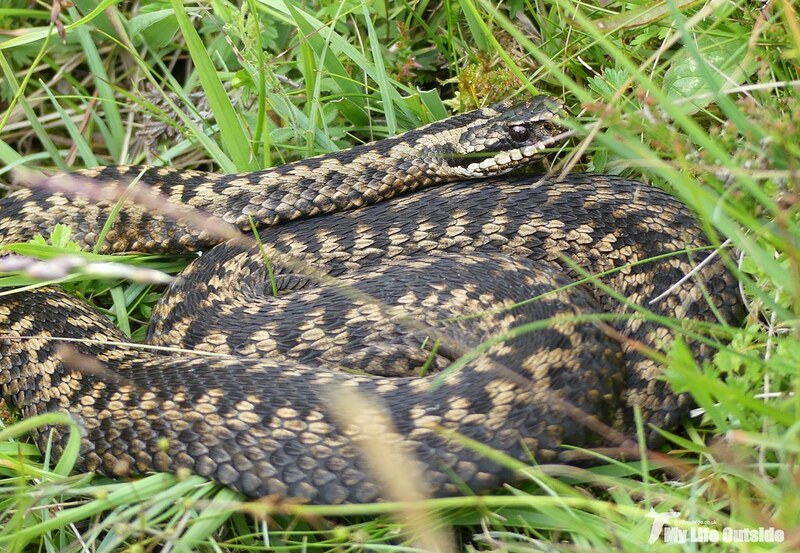 By the time we dragged ourselves away we reckoned we’d seen four different Adders, two males and two females and all as brilliant as each other. At times they’d been moving within a few inches of our prone bodies, a simply breathtaking experience that has to be experienced to be fully understood. Even better was that they appeared very site loyal, returning time after time to the same sunning spots. This bodes well for repeat visits during our stay and we shall certainly be popping by regularly. And that wasn’t all. Insects abounded with the most impressive being a Four-spotted Chaser and the most annoying the midges of which I feel we’ll be getting much better acquainted over the coming days. This plethora of life was one of the reasons we were eager to visit during summer this year instead of our more recent October jaunts, not the ideal time to see butterflies by any stretch of the imagination. 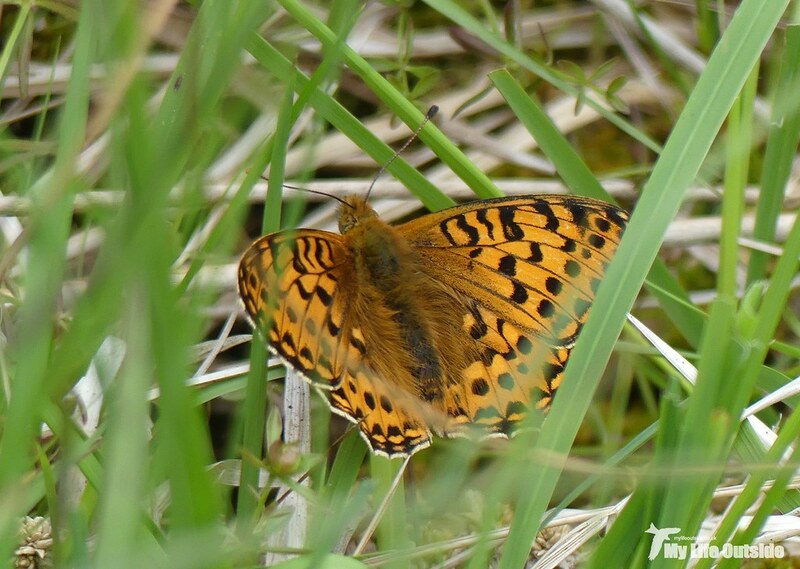 If the numerous Little Heaths and Dark Green Fritillary were anything to go by there should be good things ahead. And that was our first day on Mull. 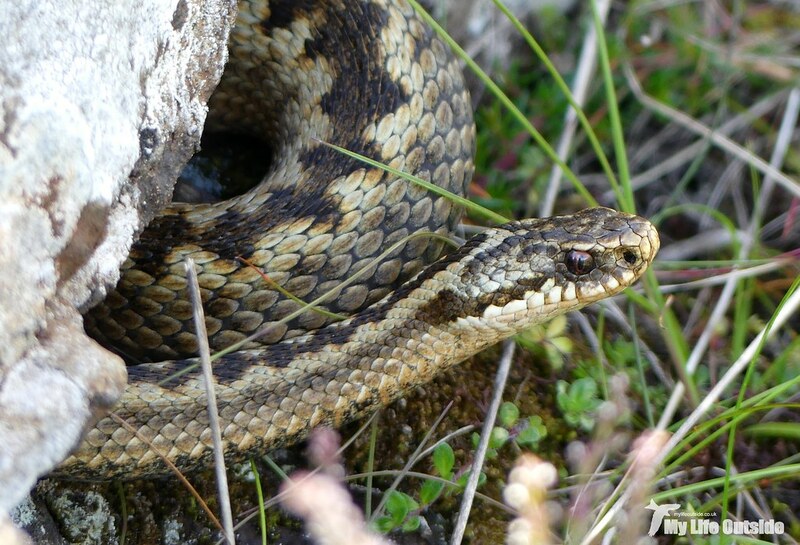 With virtually no effort we’d seen both White-tailed and Golden Eagles and had an intimate encounter with Adders. I couldn’t wait to discover what else lay ahead. 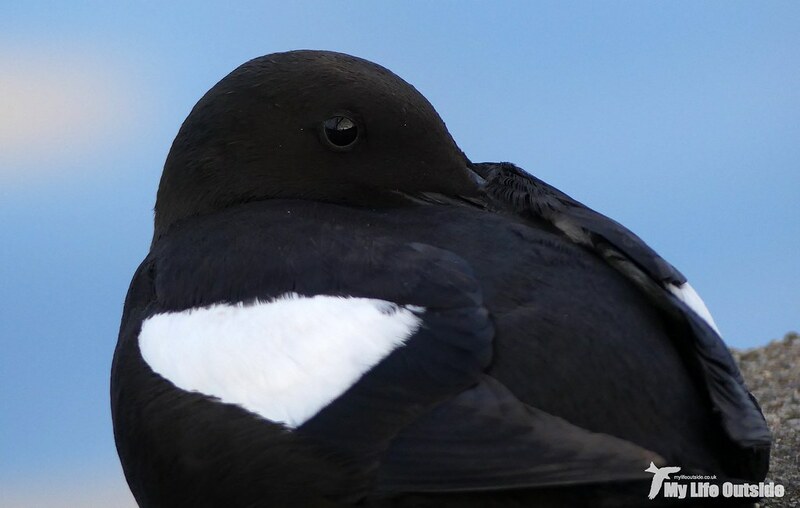 Fabulous photos of the Tysties... a bird we failed to see near the Mull of Galloway last year, after a tip-off. We last saw these lovely birds off the Summer Isles. 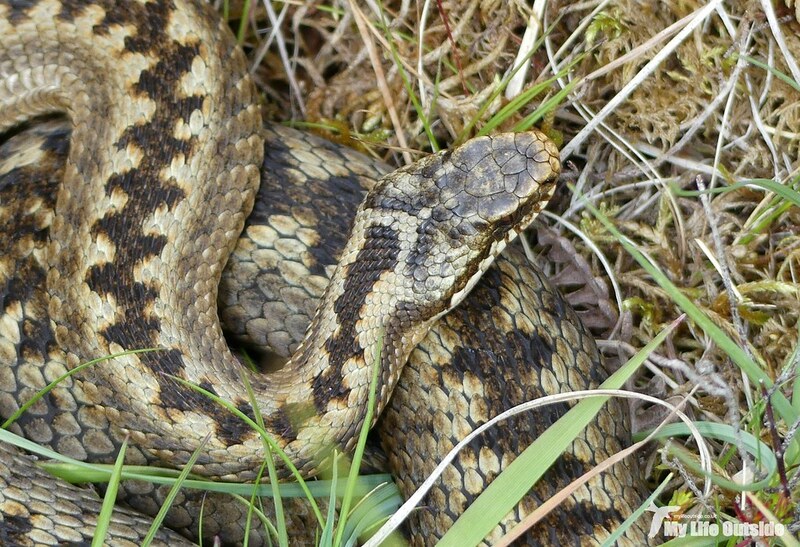 I've been on Mull only once sadly and it was with my good lady who has next to no interest in wildlife . Frustrating ! After reading this wonderfully inspiring piece I just have to get back there with a couple of decent lenses and indulge myself. Time to get selfish. Absolutely terrific read, thank you so much.